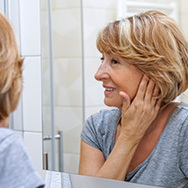 It’s quite a task to find an anti-aging cream for sensitive skin—a product to do the work of plumping, smoothing, firming, evening skin tone, diminishing the appearance of lines and wrinkles, and providing broad-spectrum sun protection—while also calming redness, soothing skin, and not causing irritation. In part, because no one product can do everything a good anti-aging routine needs to accomplish. As a result, Paula’s Choice Skincare designed two kits especially for oily skin, each containing a few products designed to work together as an anti-aging team. In particular, what makes our RESIST anti-aging line ideal for sensitive skin is that every product is fragrance-free, with textures appropriate for every skin type. The Essential Kit covers the anti-aging for oily, sensitive skin basics—for those who like a stellar, but quick routine. The Advanced Kit adds three more products for a bit more anti-aging (and oil balancing) oomph. The RESIST Essential Kit for Normal to Oily Skin includes a simple, three-step routine for a.m. and p.m.: Cleanse, exfoliate, moisturize, with sun protection during the day, and a boost of anti-aging all-star ingredients at night. RESIST Perfectly Balanced Hydrating Cleanser has a gentle cream-to-foam formula that cleanses, removes excess oil, and visibly reduces pore size without disrupting skin’s protective barrier. Like the best anti-aging cleansers, ours include soothing ingredients to calm sensitive skin. RESIST Daily Pore-Refining Treatment 2% BHA is a gentle, leave-on exfoliant that, when used once or twice per day, will give you smooth, even-toned, skin with fewer visible signs of aging. Beta hydroxy acid (BHA, or salicylic acid) works by simply loosening the bonds between dead and living skin, so surface layers slough imperceptibly—the way your skin did on its own before age and sun damage slowed the process. BHA also has the ability to exfoliate inside the pores, which clears clogs and keeps excess oil flowing freely. Our formula includes an anti-aging cocktail of antioxidants and peptides to soothe skin and protect against environmental stressors. RESIST Youth-Extending Daily Hydrating Fluid SPF 50 is a water-light, matte-finish daytime moisturizer that smooths and protects without feeling greasy. With the addition of key antioxidants and broad-spectrum sun protection, it covers all the bases if you’re shopping for the best moisturizer for oily, sensitive, aging skin. RESIST Anti-Aging Clear Skin Hydrator replaces your SPF moisturizer as the last step in your evening routine. Its lightweight formula contains vitamin C and niacinamide to target uneven skin tone and skin discolorations, address pore size, and provide maximum hydration. After cleansing morning and night, apply RESIST Weightless Advanced Repairing Toner. This potent liquid, containing peptides and niacinamide, visibly smooths signs of sun damage, minimizes the appearance of enlarged pores, and improves an uneven skin tone. It’s hydrating enough to substitute as your nighttime moisturizer when you want an even lighter form of moisture. After your once-or-twice daily BHA exfoliation, apply water-light RESIST Ultra-Light Daily Antioxidant Serum for a visible boost of firming and rejuvenation. And, once per week (more often if your skin needs it), use RESIST Advanced Pore-Refining Treatment 4% BHA for a more dramatic (but still gentle) time-released refining of skin’s surface texture. Learn more about anti-aging & wrinkle solutions. Learn more about oily skin. Learn more about sensitive skin.